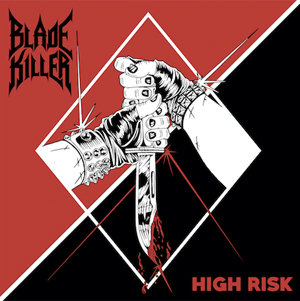 BLADE KILLER Unveil Debut LP Title Track "High Risk"
Recently praised by their hometown LA Weekly as Los Angeles' “best new old-school metal band,” the upstart traditional heavy metal quintet BLADE KILLER will release their debut album, High Risk, on Nov. 23 via M-Theory Audio. A lyric video for the album's anthemic title track can be seen now below, while the song will be available on streaming platforms. Featuring a strong NWOBHM (and particularly, Di'Anno-era IRON MAIDEN) influence, High Risk is an eight-track, 29-minute ripper sure to please fans of pure heavy metal. The album was recorded by Allen Falcon at L.A.'s Birdcage Studios and mixed and mastered by ENFORCER vocalist Olaf Wikstrand (TRIBULATION, CAULDRON). The cover art, seen below, was designed by noted tattoo artist Alex Matus. High Risk is available for pre-order on CD, cassette and limited-edition black-and-white vinyl. Digital pre-orders, which will include an instant download of the title track, are underway now on Bandcamp and will begin elsewhere tomorrow. On Sunday, BLADE KILLER will play the Frost & Fire festival's “Bangover” after-party at Que Sera in Long Beach, California, which also features Screamer, Grinder, Road Rash and Bewitcher. Additional live appearances will be announced in the coming weeks.